This page lists some of the logos and posters I’ve made for different people and events. Open Source, Free-as-in-Speech, and Free-as-in-Beer: Download PDF. ThatScottishEngineer: This logo was created for personal use by Alistair Marshall of ThatScottishEngineer. ThatScottishEngineer uses technology to improve the field of chemical engineering. This design shows a computer mouse inputting into a chemical engineering process. This logo is copyright Denise Wood 2009. Cambridge TEC: This logo was created for the Cambridge Technology Export Communication. My design was black-and-white. The curve of Cambridge and the curved tail on the ‘g’ is meant to symbolise both the bridges of Cambridge and the bridge between Cambridge and the other countries reached by Cambridge TEC. Colour was added by the company. This logo is copyright Cambridge Technology Export Communication 2011. 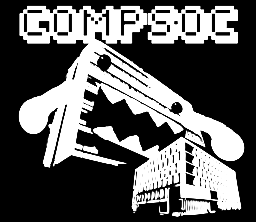 The University of Edinburgh Computing Society 2010:This design was created specifically for the UofE CompSoc hoodie. It features Appleton Tower as Domo-kun, terrorising the neighbouring Informatics Forum. The back of the hoodie had a LaTeX cheat sheet inspired by my talk on LaTeX earlier in the year.